Wolfgang Puck is prepping for what will be his twenty-fourth Academy Awards. Here’s something most people don’t realize: the Oscars are held at a shopping mall. A really nice, outdoor shopping mall. It’s called the Hollywood and Highland Center in Los Angeles, and that’s where the Dolby Theater is located. And that’s where we went on Thursday morning for the 2018 official Oscars press preview event. We did it in the name of journalism—and snacks. Surrounded by a gaggle of international TV reporters and camera operators, we were given hot pink wristbands and shepherded through a maze of hallways through the bowels of the mall. Finally, we popped out into the sunlight, onto a patch of red carpet. It was magical. The thinnest of veils—literally, a mesh curtain—separated us from unsuspecting tourists and a guy in a Spider-Man costume. All media were then led into a medium-sized room, laden with blue-black velvet and replicas of Oscar statues of varying size. Some of the smaller ones we learned, were solid tempered chocolate. Like we said, it was magical. Behind it all was the legend himself: Wolfgang Puck, prepping for what will be his twenty-fourth Academy Awards. 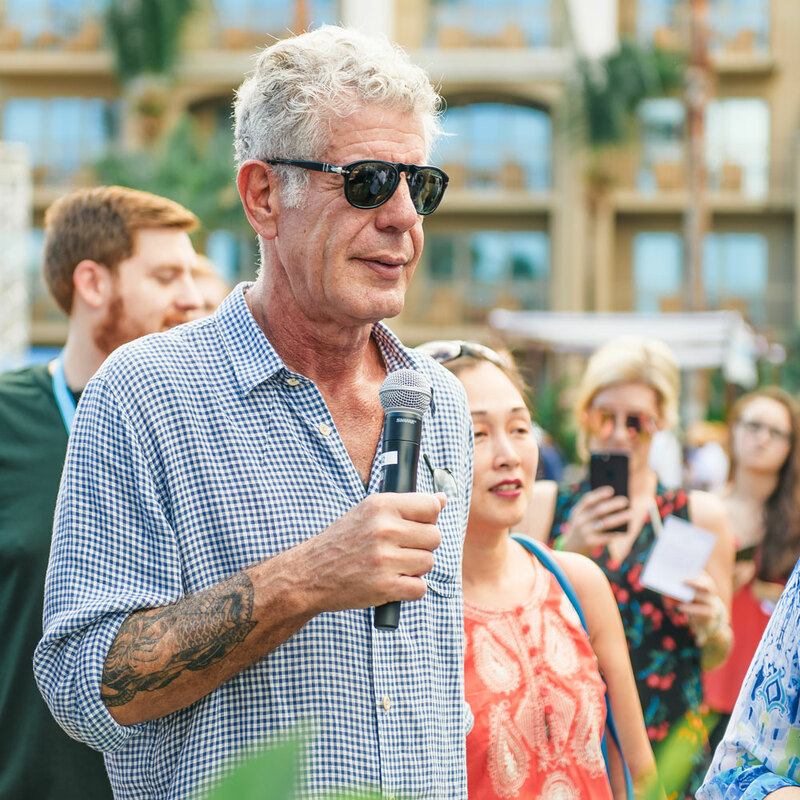 Los Angeles is where he rose to fame with his flagship restaurant Spago, so cheffing the city’s landmark event has to mean something special. Puck was surrounded by a small retinue of sous chefs—with a noticeably high proportion of attractive French men, we couldn’t help but notice—all deftly occupied with a repetitive task. One was sizzling morsels of the A5 Wagyu on an electric griddle; another was spinning gold-dusted orbs of caramelized sugar. One of Puck’s sons was there as well, helping out. A crowd of TV reporters three people thick were asking questions. A German-speaking journalist holding a tape recorder elbowed us to get a better look. We got hit in the head with video camera at one point. But it was worth it. The best thing we tasted was probably the handheld black truffle chicken pot pie, which seem to double as a muscle relaxer. The dish carried no crazy surprises, and it wasn’t even that Instagrammable—just comforting to the bones. It was easily the culinary highlight. Also being passed around were gold foil-wrapped twice baked potatoes, topped with crème fraîche and some of that perfectly salty, marine caviar which cut through the sweetness of the dairy and potato perfectly. Intriguingly, it’s called potato caviar 2.0. There were also hard shell toro tacos, filled with fatty tuna and microgreens, BLT deviled eggs (topped with bacon and tomato, of course), and matzo silhouetted like Oscar statuettes, topped with smoked salmon and caviar. This is to say nothing of the desserts: Orbs of cassis mousse as precious as fancy hotel soap, prepared in pillow-shaped molds with sablé bottoms. There were hard cocoa butter shells filled with the juice of rhubarb and strawberry, made to explode in your mouth and leave the slightest hint of thai chile lingering on your palate. Perhaps the most intriguing dessert, however, was the interactive one: a hardened sugar orb mixed with edible gold, reminiscent of a most beautiful Christmas ornament. You crack it with your fork, to reveal baby pink raspberry coulis, fresh raspberry, and edible flowers. And, of course, there were drinks. Francis Ford Coppola’s Sonoma, California winery is going to be making its second appearance at the awards show this year, showcasing a 2016 Chardonnay and a 2015 Cabernet Sauvignon which are bottled specifically for the event with specially printed labels. You’ll be able to order the same wines through the winery’s website, but they won’t be in the same Oscars bottle. The cinema tie-in with Coppola’s winery is obvious, and it’s reputed that that is something the Academy looks for when considering culinary partners. Champagne will be provided by Piper-Heidsieck—apparently the brand was Marilyn Monroe’s favorite—and the spirit spotlighted this year will be tequila, provided by category titan Don Julio. Last year the spirit of choice was whiskey. We were sad to leave the event, which still boasted hosts of uneaten cake pops and slabs of cooked Wagyu—we hope they went to a good home—but, at least from 10am-12pm on Thursday morning, we did indeed feel like a star.